Why can't they just use a photographer? In many cases in the US (and the UK and Canada), cameras aren't allowed into the courtroom. Especially in high-profile trials, where the presence of many media personnel and their equipment would present a distraction for the court. (There are exceptions, of course, and some states allow camera blanket access to courtrooms). A sketch artist, however, armed with a pad and some charcoal pencils, is usually less intrusive than someone with a bulky, ever-clicking camera. 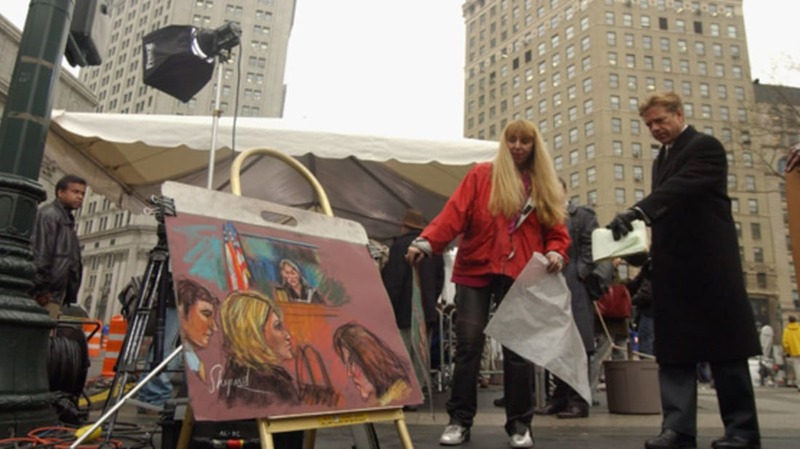 Even then, though, sketch artists are sometimes not permitted to actually draw during court proceedings, lest they cause a distraction, and must draw later from memory or notes. A federal judge in Oklahoma infamously threw a Texas television station's sketch artist out of his courtroom, claiming that the artist's work disrupted the trial. Before the 1950s, cameras were commonly allowed in courtrooms. They were gradually shut out after several convictions were overturned by appellate courts based on claims that the atmosphere created by the media presence led to unfair trials—most notably, the case of Sam Sheppard. By the mid-1960s, Texas and Colorado were the only two states still allowing cameras, but similar overturned convictions convinced both states to finally join the camera ban. As cameras get smaller, quieter and less conspicuous, though, they may make a comeback in the courtroom, and several states have already started allowing their use again. One courtroom that won't be getting cameras any time soon is the U.S. Supreme Court. Justice David H. Souter was particularly strong in his feelings on the subject. He said, "I can tell you the day you see a camera come into our courtroom, it's going to roll over my dead body." Is this a real career? How much might I get paid? While a few court sketch artists might be on-staff at newspapers and TV stations, the bulk of them are freelance. Like other media freelancers, the money depends on what kind of work they're doing and for whom they're doing it. The sustainability of the career depends on how good they are and how much they can hustle. Often, sketch artists can take their talents to more lucrative, or at least solid, jobs on the side. Steve Werblun, who'd sketched for the Philadelphia Daily News since 1975, left for Hollywood after 30 years and has worked as a storyboard artist on films like The Day After Tomorrow, Along Came Polly, and Dirty Dancing: Havana Nights. Dana Verkouteren, who's sketched for CNN, ABC, FOX and other broadcast outlets, sidelines as an illustrator and caricaturist. What happens to the sketches after the trial? Depending on the contract between the sketch artist and the media outlet, one party or the other keeps the sketches and the right to their use. Sometimes, the artists might sell their drawings to memento-seeking judges or attorneys depicted in them. The lawyers involved in former New York Knicks coach Isiah Thomas' 2007 sexual harassment case reportedly bought a good number of sketches produced during the trial.